Thunk of the Day Is pleasure the goal of all humanity? Knowledge you will gain today 1. 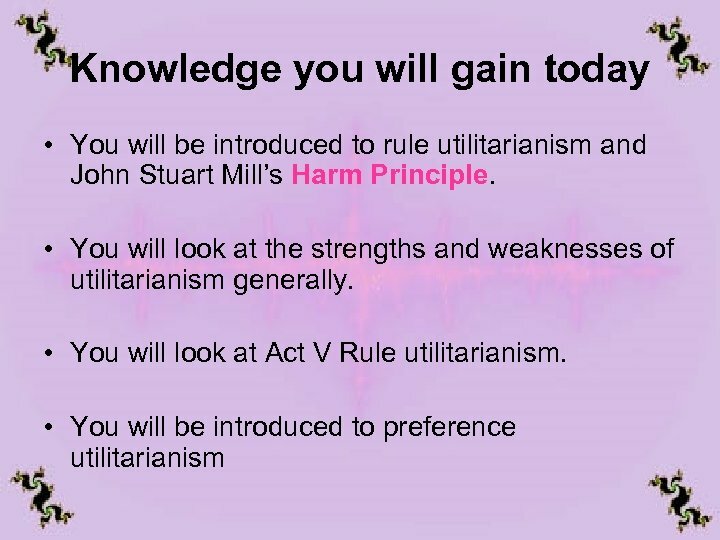 You will be introduced to classical utilitarianism. 2. You will be introduced to act, rule and preference utilitarianism. 3. 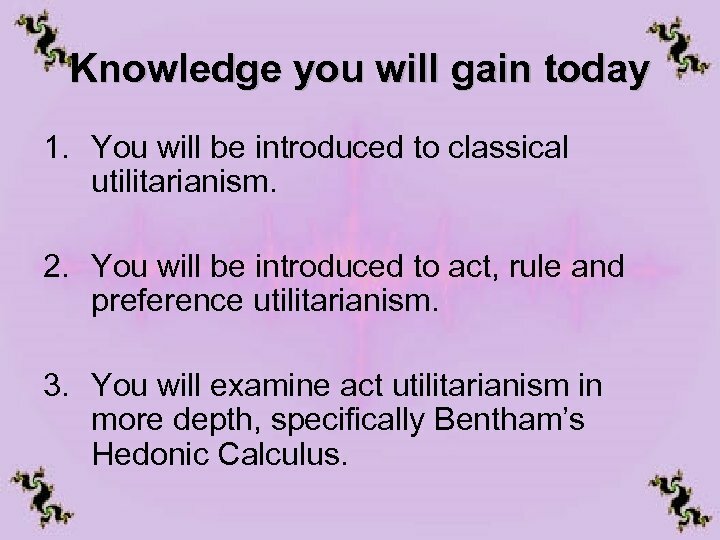 You will examine act utilitarianism in more depth, specifically Bentham’s Hedonic Calculus. 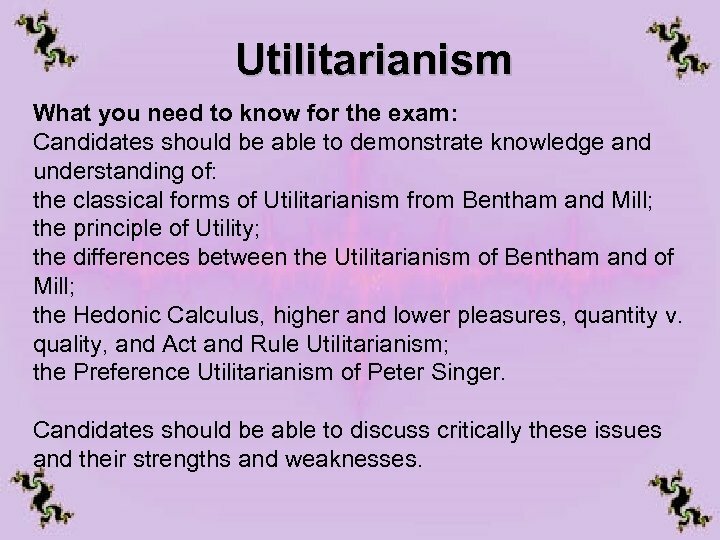 Utilitarianism What you need to know for the exam: Candidates should be able to demonstrate knowledge and understanding of: the classical forms of Utilitarianism from Bentham and Mill; the principle of Utility; the differences between the Utilitarianism of Bentham and of Mill; the Hedonic Calculus, higher and lower pleasures, quantity v. quality, and Act and Rule Utilitarianism; the Preference Utilitarianism of Peter Singer. Candidates should be able to discuss critically these issues and their strengths and weaknesses. 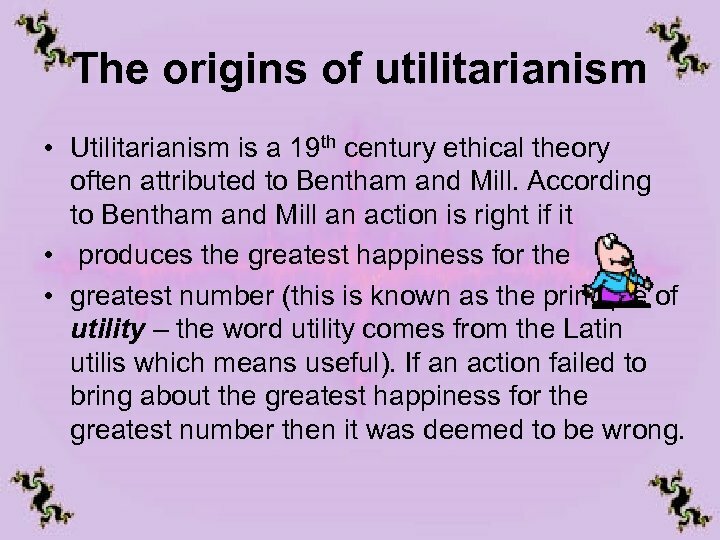 The origins of utilitarianism • Utilitarianism is a 19 th century ethical theory often attributed to Bentham and Mill. According to Bentham and Mill an action is right if it • produces the greatest happiness for the • greatest number (this is known as the principle of utility – the word utility comes from the Latin utilis which means useful). If an action failed to bring about the greatest happiness for the greatest number then it was deemed to be wrong. As requested in his will, Bentham's body was dissected as part of a public anatomy lecture. Afterward, the skeleton and head were preserved and stored in a wooden cabinet called the "Auto-icon", with the skeleton stuffed out with hay and dressed in Bentham's clothes. It is normally kept on public display at the end of the South Cloisters in the main building of the college, but for the 100 th and 150 th anniversaries of the college, it was brought to the meeting of the College Council, where it was listed as "present but not voting". The Auto-icon has a wax head, as Bentham's head was badly damaged in the preservation process. The real head was displayed in the same case for many years, but became the target of repeated student pranks, including being stolen on more than one occasion. It is now locked away securely. The Principle Of Utility • The principle of utility is teleological, it is concerned not with an act or deed in itself but rather with the outcome or consequence. • Therefore in order to try and bring about the greatest happiness for the greatest number I act in a manner appropriate to the situation. If the situation changes then so too should my actions. According to this position acts are not right or wrong in themselves (deontological). Discuss • Identify pleasures that are bad for us and pains that are good for us. • Ought the views of minorities to be considered in every situation? 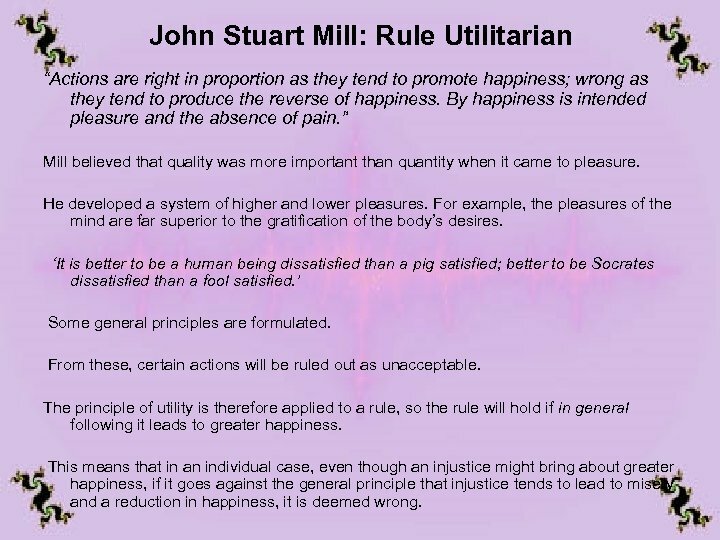 What is meant by happiness within Utilitarianism? • This is a key philosophical question the answer to which may encourage a person to accept or reject theory. • Generally speaking happiness means pleasure within utilitarianism. However it would be fair to say that some disagreement exists between various utilitarian thinkers as to what exactly constitutes pleasure/happiness. This becomes evident when each thinker is considered in isolation. 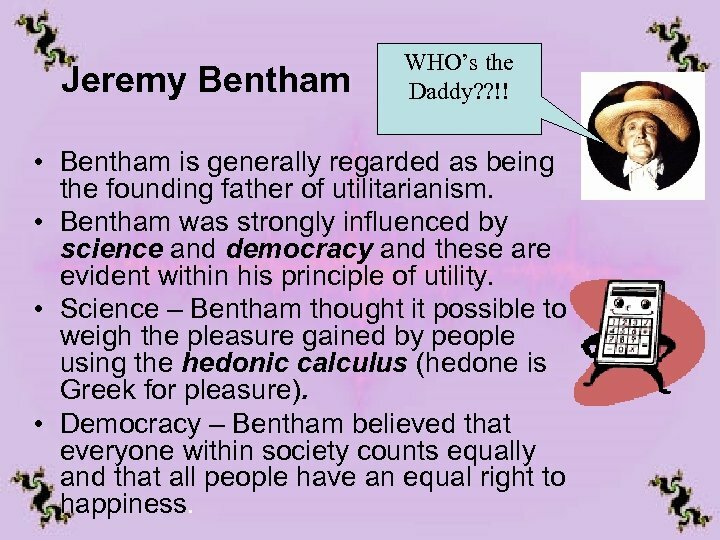 Jeremy Bentham WHO’s the Daddy? ? !! 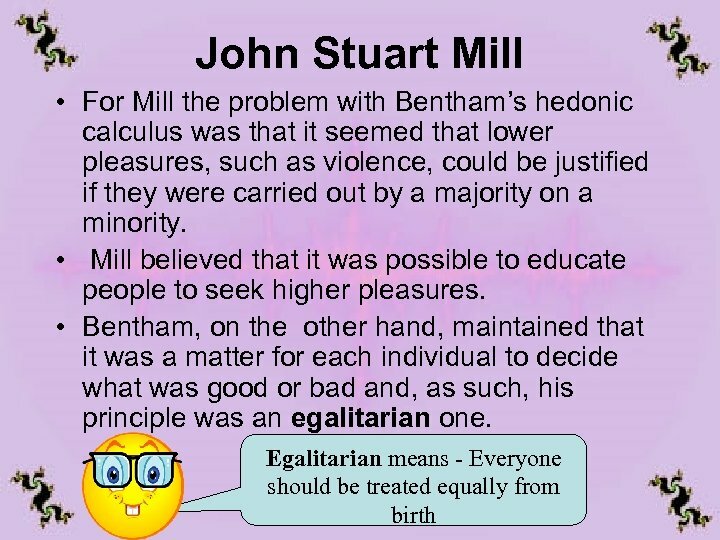 • Bentham is generally regarded as being the founding father of utilitarianism. • Bentham was strongly influenced by science and democracy and these are evident within his principle of utility. • Science – Bentham thought it possible to weigh the pleasure gained by people using the hedonic calculus (hedone is Greek for pleasure). • Democracy – Bentham believed that everyone within society counts equally and that all people have an equal right to happiness. Jeremy Bentham • Bentham’s theory is one of universal ethical hedonism – if an action brings or increases pleasure then it is right. Bentham devised the hedonic calculus to calculate the most pleasurable action. • Seven elements are taken into consideration – (1) intensity, how intense is it? , (2) duration, how long does the sensation last? (3) certainty, how sure are you? (4) remoteness, how near is it? (5) richness, will it lead to further pleasure? (6) purity, are there any ill effects? (7) extent, how wide are its effects. Jeremy Bentham • Bentham’s brand of utilitarianism is often referred to as act utilitarianism because it is based on actions. It makes a quantitative assessment. Thus if more people gain pleasure than pain through a certain act then the act is permissible and ought to be pursued according to Bentham. Discuss • Do you accept Bentham’s claim that pleasure is the sole good and pain the sole evil? • Do you believe it is possible to measure pleasure and pain using the hedonic calculus or any other method? • Jeremy Bentham is often accused of ‘crude reductionism’. What do you think this term means? Do you consider Bentham to be a crude reductionist? Explain your answer. Discuss • Is it better to be intellectually aware of the world’s imperfections and the suffering of people and, hence, be unhappy or dissatisfied, or is it better to be blissfully ignorant of the world’s troubles and, hence, be happy and content with life? 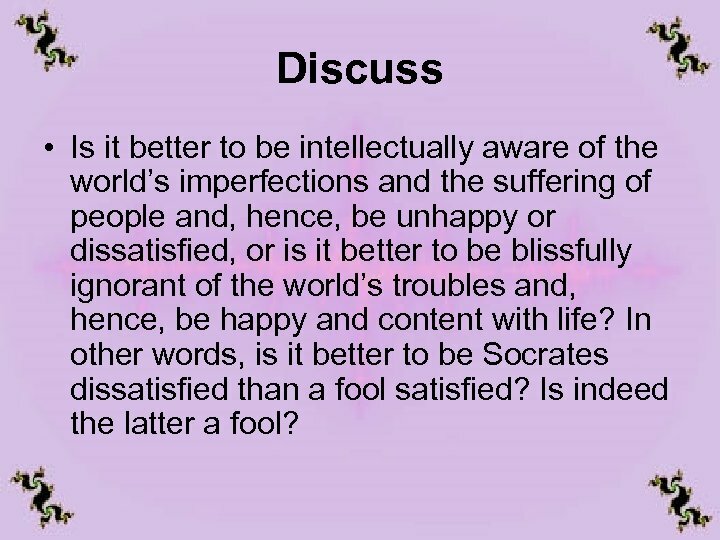 In other words, is it better to be Socrates dissatisfied than a fool satisfied? Is indeed the latter a fool? 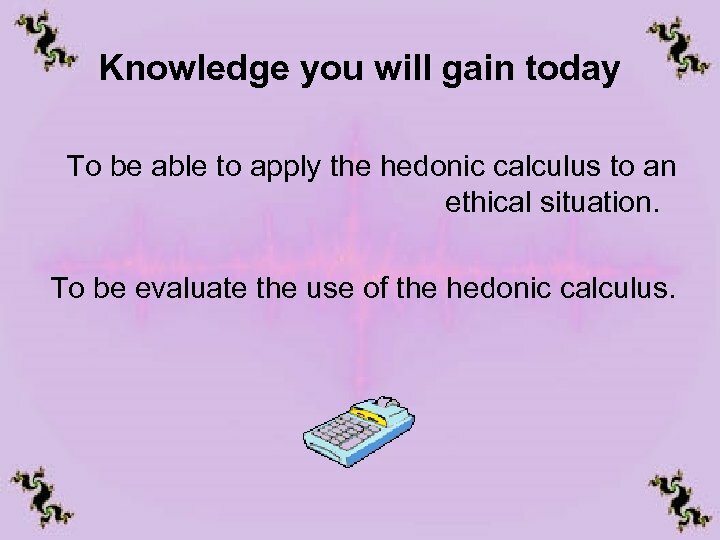 Knowledge you will gain today To be able to apply the hedonic calculus to an ethical situation. To be evaluate the use of the hedonic calculus. 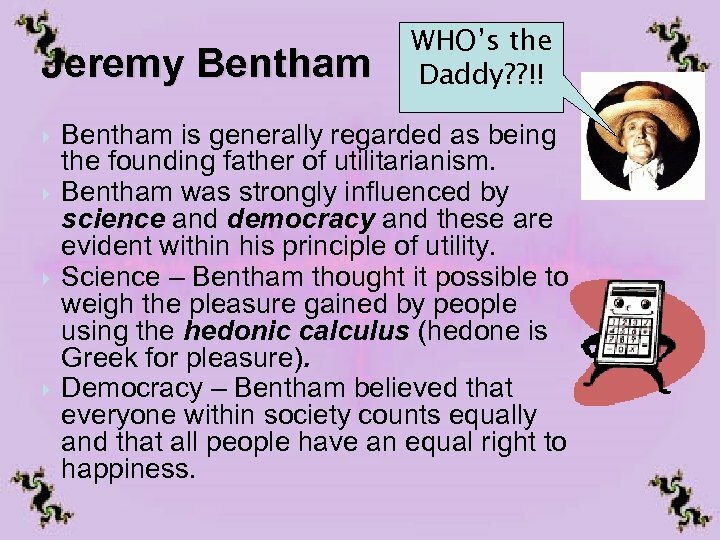 Jeremy Bentham WHO’s the Daddy? ? !! 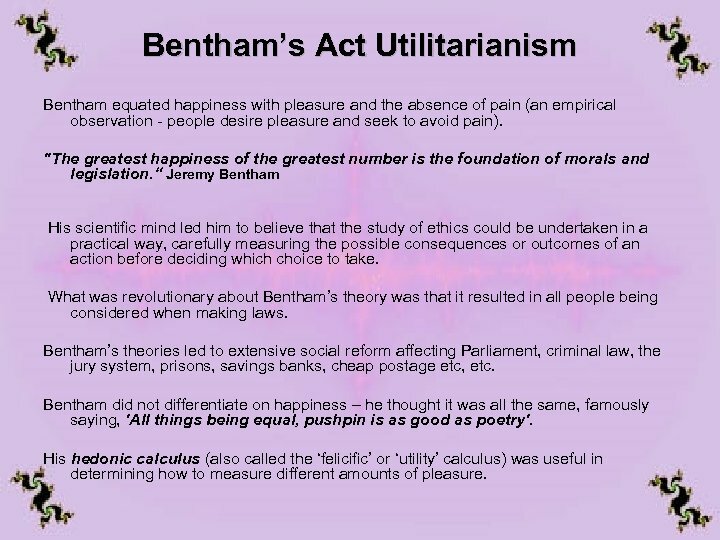 Bentham is generally regarded as being the founding father of utilitarianism. 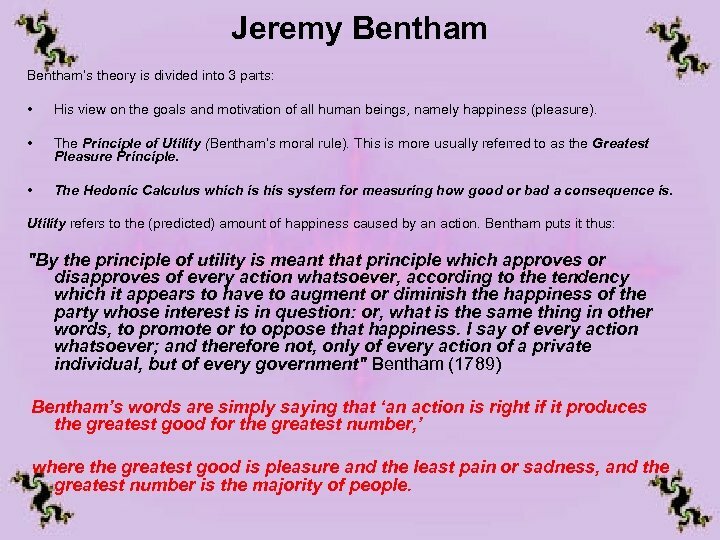 Bentham was strongly influenced by science and democracy and these are evident within his principle of utility. Science – Bentham thought it possible to weigh the pleasure gained by people using the hedonic calculus (hedone is Greek for pleasure). Democracy – Bentham believed that everyone within society counts equally and that all people have an equal right to happiness. This is called the Pleasure Beach at Blackpool • What is the concept behind the name of this place? • How valid is it? What exactly does Bentham mean by pleasure? • Bentham is pleasure and Mill is happiness. • DISCUSS - What is the difference between pleasure and happiness? • Write out some criteria for defining them. Extension activity– stretch and challenge ‘The only good is pleasure. The only evil is pain. ’ Is this a valid statement? Hedonic Calculus Helps us choose the good thing to do and work out the possible consequences of an action. • Purity – how free from pain is it? • Remoteness – how near is it? • Richness – to what extent will it lead to other pleasures? • Intensity – how powerful is it? • Certainty – how likely it is to result in pleasure? • Extent – how many people does it affect? • Duration – how long will it last? If you were to measure pleasure (Hedonism), how would you do it? What would you look for? 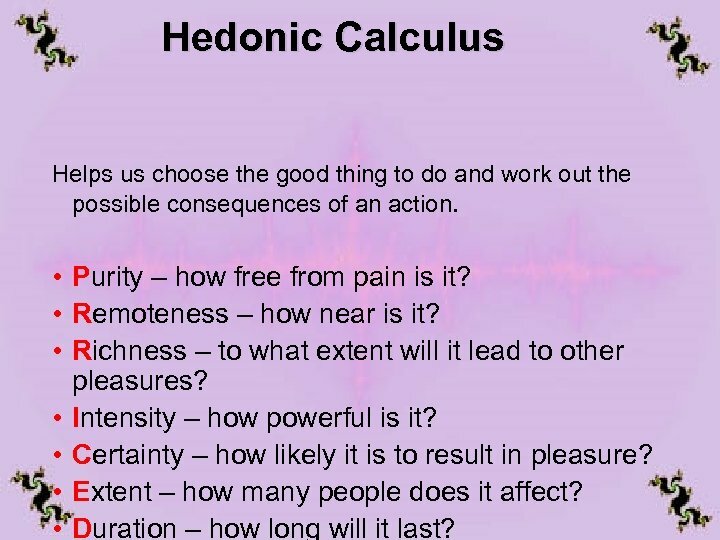 How to use the Hedonic Calculus • Hedone – pleasure • Dolors - pain OR…. Your task • Create a choice of two different activities. E. g having a tattoo or going to school. Swap with your partner - using the hedonic calculus –work through and explain the ‘good’ action. What would a utilitarian conclude is the right thing to do? 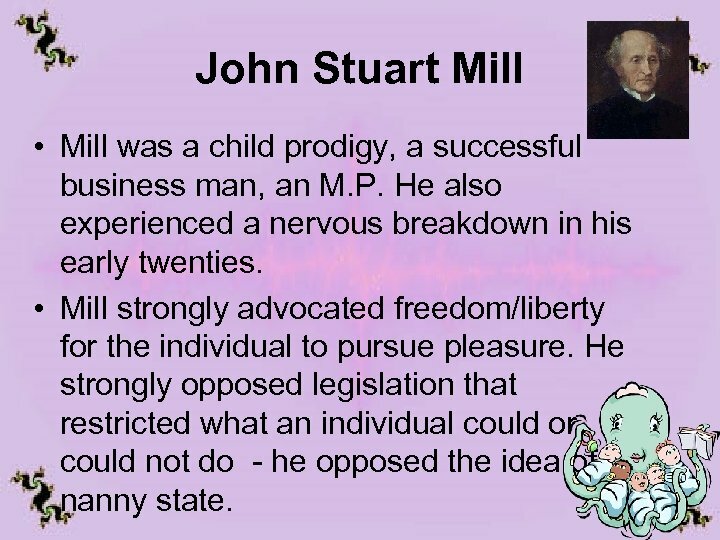 John Stuart Mill • Mill was a child prodigy, a successful business man, an M. P. He also experienced a nervous breakdown in his early twenties. • Mill strongly advocated freedom/liberty for the individual to pursue pleasure. He strongly opposed legislation that restricted what an individual could or could not do - he opposed the idea of a nanny state. 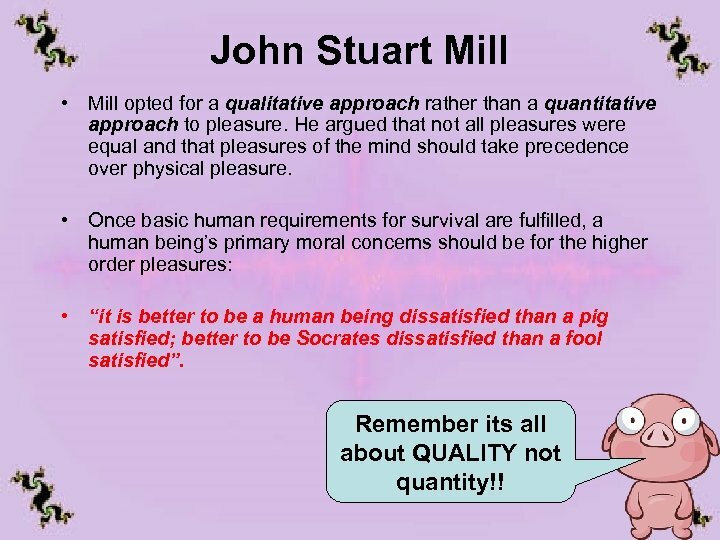 John Stuart Mill • Mill opted for a qualitative approach rather than a quantitative approach to pleasure. He argued that not all pleasures were equal and that pleasures of the mind should take precedence over physical pleasure. • Once basic human requirements for survival are fulfilled, a human being’s primary moral concerns should be for the higher order pleasures: • “it is better to be a human being dissatisfied than a pig satisfied; better to be Socrates dissatisfied than a fool satisfied”. Remember its all about QUALITY not quantity!! 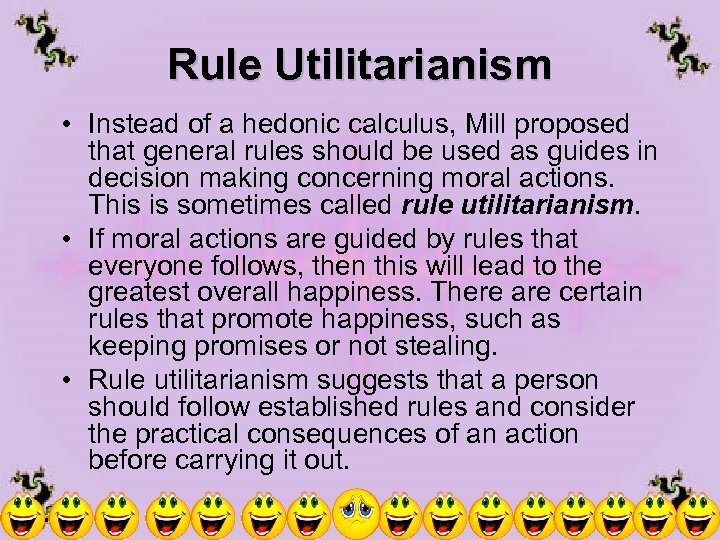 Rule Utilitarianism • Instead of a hedonic calculus, Mill proposed that general rules should be used as guides in decision making concerning moral actions. This is sometimes called rule utilitarianism. • If moral actions are guided by rules that everyone follows, then this will lead to the greatest overall happiness. There are certain rules that promote happiness, such as keeping promises or not stealing. • Rule utilitarianism suggests that a person should follow established rules and consider the practical consequences of an action before carrying it out. 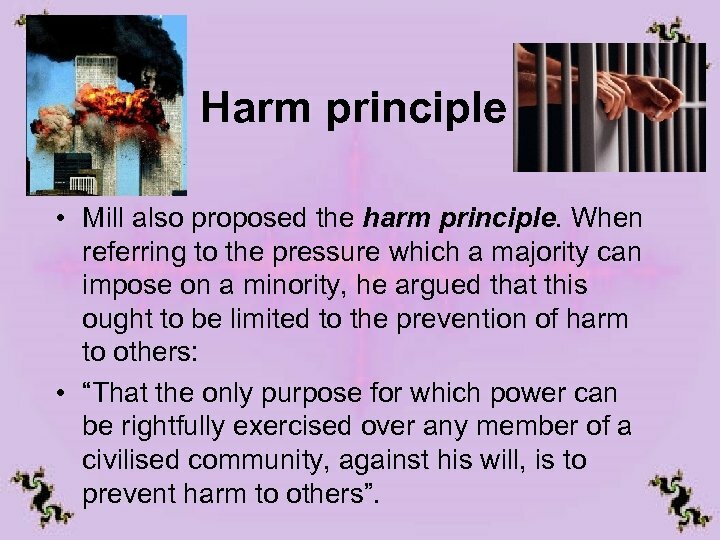 Harm principle • Mill also proposed the harm principle. When referring to the pressure which a majority can impose on a minority, he argued that this ought to be limited to the prevention of harm to others: • “That the only purpose for which power can be rightfully exercised over any member of a civilised community, against his will, is to prevent harm to others”. 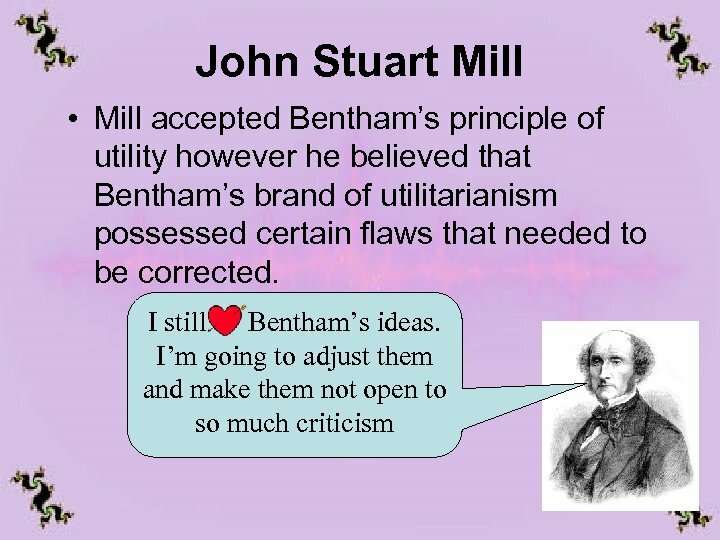 Discuss • Do you consider Mill’s version of utilitarianism to be more appealing than Bentham’s? Explain your answer. • Do you accept Mill’s claim that pleasures form a hierarchy and that pleasures of the mind should take priority over physical pleasures? 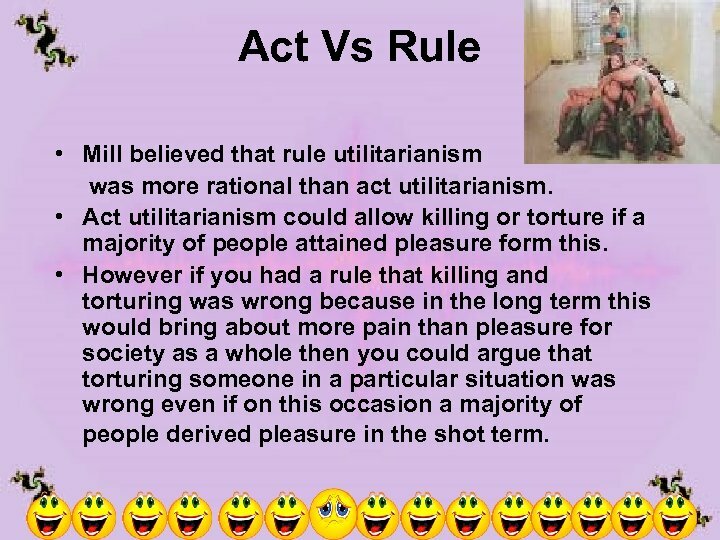 Act Vs Rule • Mill believed that rule utilitarianism was more rational than act utilitarianism. • Act utilitarianism could allow killing or torture if a majority of people attained pleasure form this. • However if you had a rule that killing and torturing was wrong because in the long term this would bring about more pain than pleasure for society as a whole then you could argue that torturing someone in a particular situation was wrong even if on this occasion a majority of people derived pleasure in the shot term. 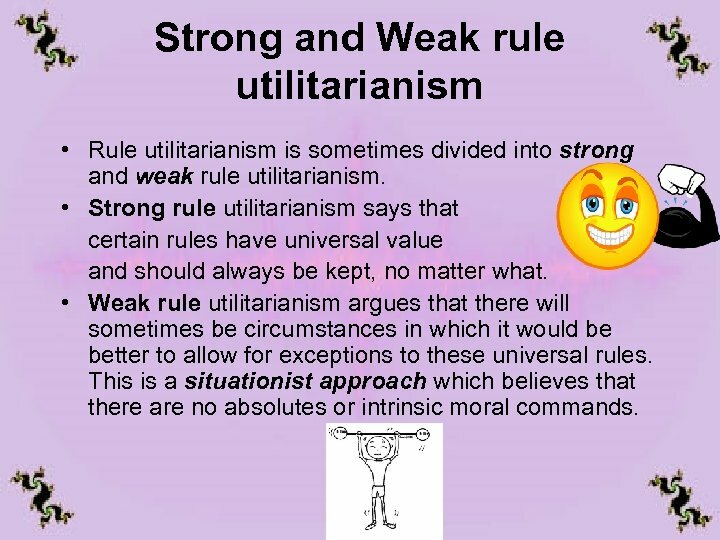 Strong and Weak rule utilitarianism • Rule utilitarianism is sometimes divided into strong and weak rule utilitarianism. • Strong rule utilitarianism says that certain rules have universal value and should always be kept, no matter what. • Weak rule utilitarianism argues that there will sometimes be circumstances in which it would be better to allow for exceptions to these universal rules. This is a situationist approach which believes that there are no absolutes or intrinsic moral commands. 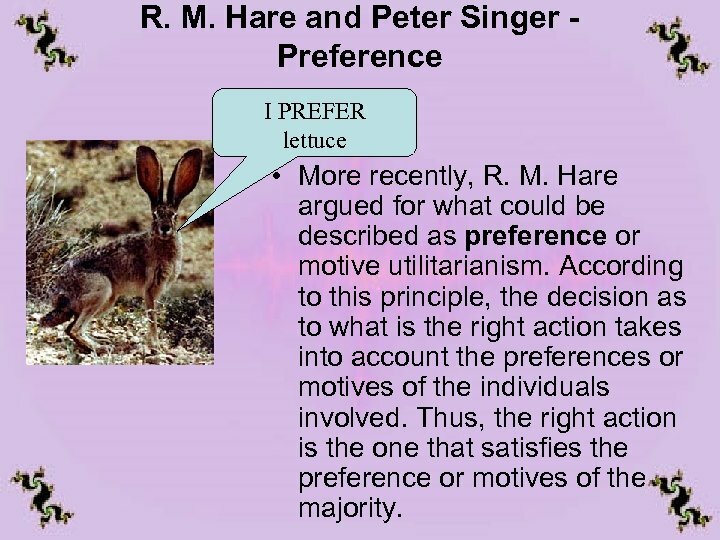 R. M. Hare and Peter Singer Preference I PREFER lettuce • More recently, R. M. Hare argued for what could be described as preference or motive utilitarianism. According to this principle, the decision as to what is the right action takes into account the preferences or motives of the individuals involved. Thus, the right action is the one that satisfies the preference or motives of the majority. 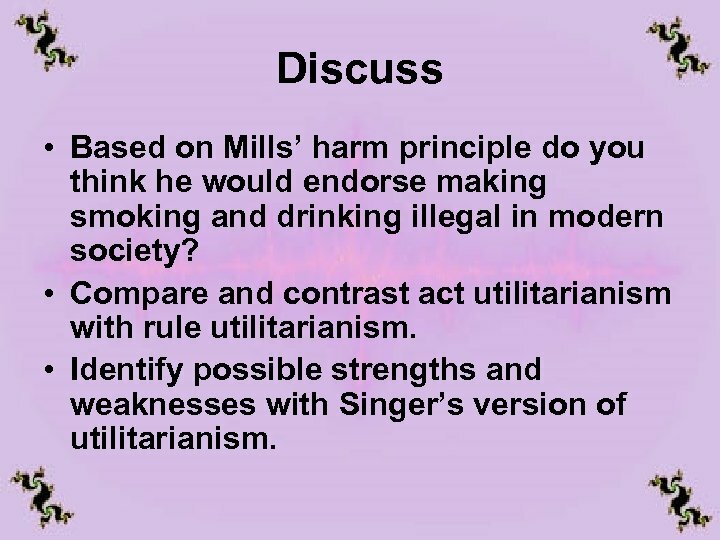 Discuss • Based on Mills’ harm principle do you think he would endorse making smoking and drinking illegal in modern society? 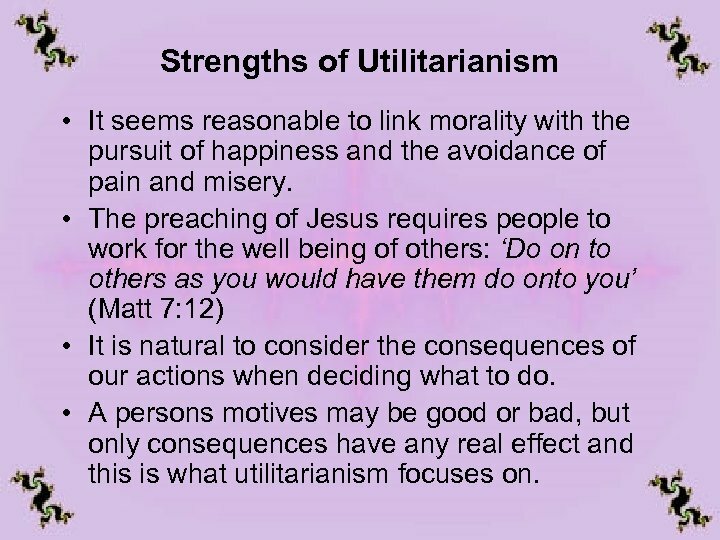 • Compare and contrast act utilitarianism with rule utilitarianism. • Identify possible strengths and weaknesses with Singer’s version of utilitarianism. 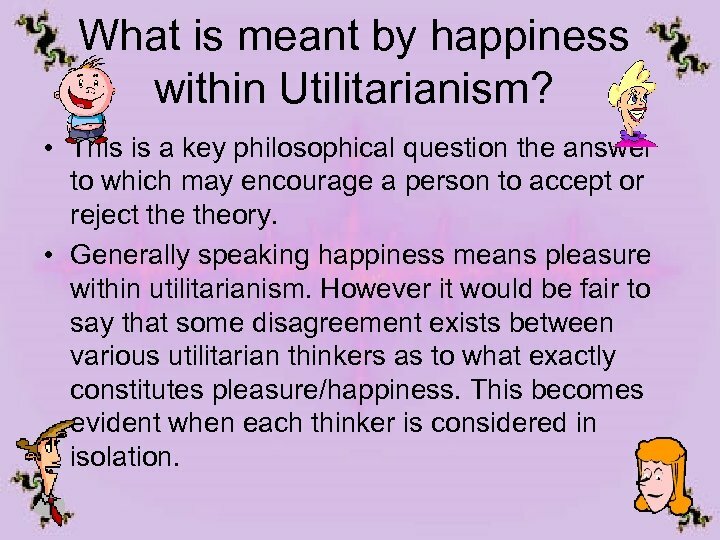 Strengths of Utilitarianism • It seems reasonable to link morality with the pursuit of happiness and the avoidance of pain and misery. • The preaching of Jesus requires people to work for the well being of others: ‘Do on to others as you would have them do onto you’ (Matt 7: 12) • It is natural to consider the consequences of our actions when deciding what to do. • A persons motives may be good or bad, but only consequences have any real effect and this is what utilitarianism focuses on. Strengths of Utilitarianism generally • The principle encourages democracy. The interests of the majority are considered, and a dangerous minority is not allowed to dominate. • Current circumstances can be judged without reference to previous ones. For example just because it would be wrong for woman A to have an abortion, it does not necessarily follow that in woman B’s completely different circumstances it would be wrong for her. 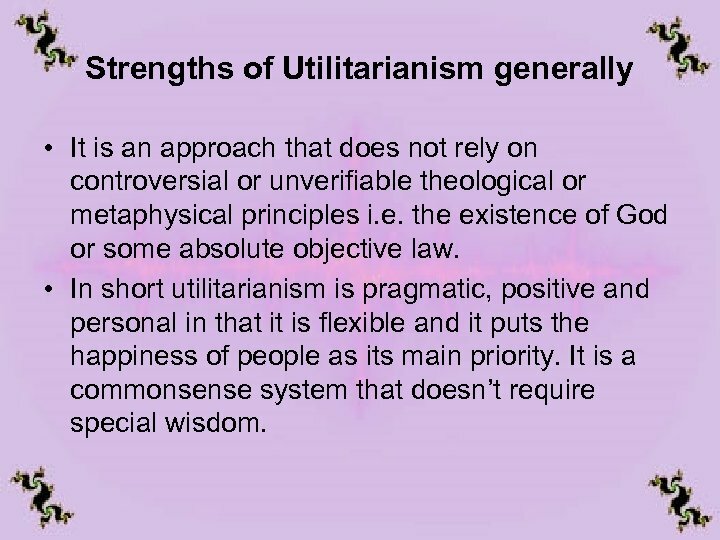 Strengths of Utilitarianism generally • It is an approach that does not rely on controversial or unverifiable theological or metaphysical principles i. e. the existence of God or some absolute objective law. • In short utilitarianism is pragmatic, positive and personal in that it is flexible and it puts the happiness of people as its main priority. It is a commonsense system that doesn’t require special wisdom. Discuss • Does human well being rely on pleasure? • We live in a society that values and promotes democracy. Can you identify potential problems with democracy? • Do you consider the consequences of an action to be more important that the motives behind an action? Explain your answer. 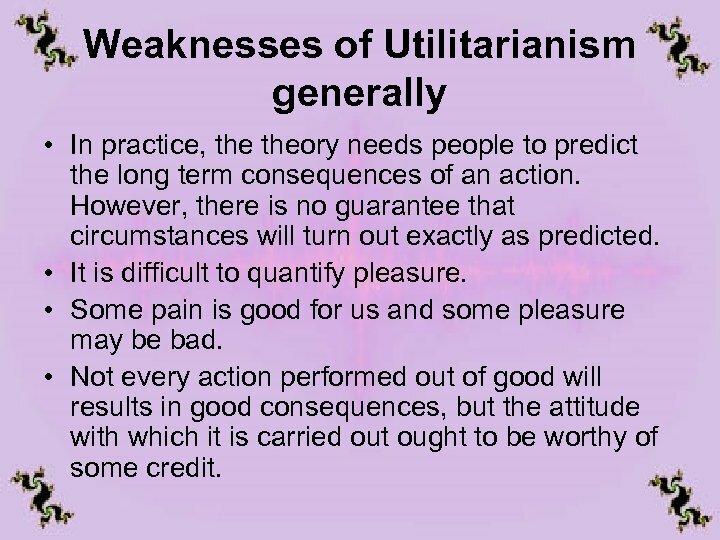 Weaknesses of Utilitarianism generally • In practice, theory needs people to predict the long term consequences of an action. However, there is no guarantee that circumstances will turn out exactly as predicted. • It is difficult to quantify pleasure. • Some pain is good for us and some pleasure may be bad. • Not every action performed out of good will results in good consequences, but the attitude with which it is carried out ought to be worthy of some credit. 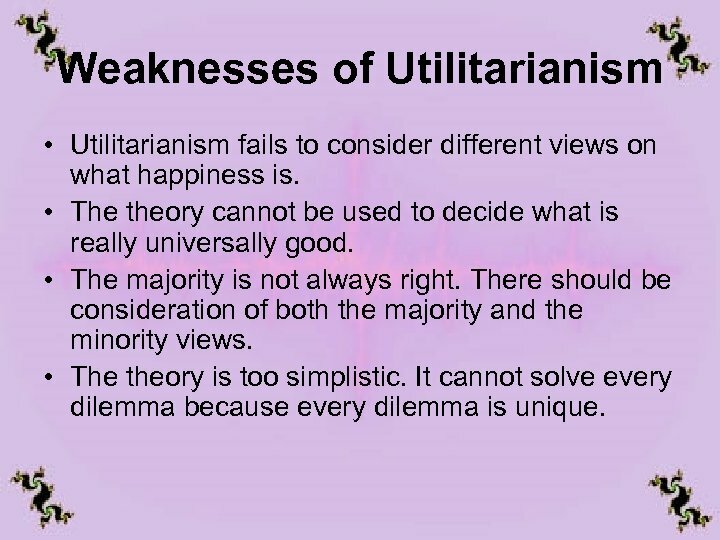 Weaknesses of Utilitarianism • Utilitarianism fails to consider different views on what happiness is. • The theory cannot be used to decide what is really universally good. • The majority is not always right. There should be consideration of both the majority and the minority views. • The theory is too simplistic. It cannot solve every dilemma because every dilemma is unique. 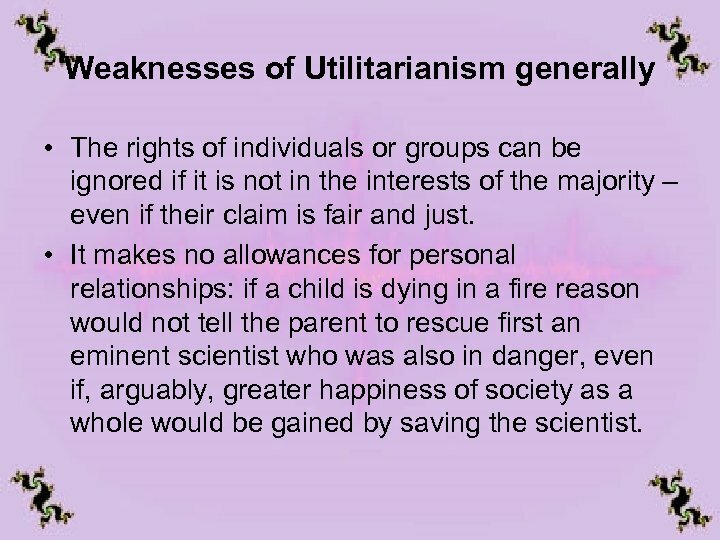 Weaknesses of Utilitarianism generally • The rights of individuals or groups can be ignored if it is not in the interests of the majority – even if their claim is fair and just. • It makes no allowances for personal relationships: if a child is dying in a fire reason would not tell the parent to rescue first an eminent scientist who was also in danger, even if, arguably, greater happiness of society as a whole would be gained by saving the scientist. 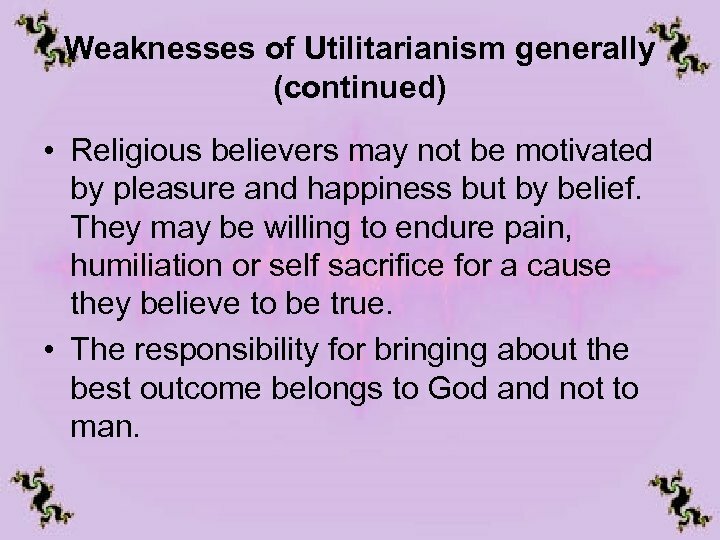 Weaknesses of Utilitarianism generally (continued) • Religious believers may not be motivated by pleasure and happiness but by belief. They may be willing to endure pain, humiliation or self sacrifice for a cause they believe to be true. • The responsibility for bringing about the best outcome belongs to God and not to man. 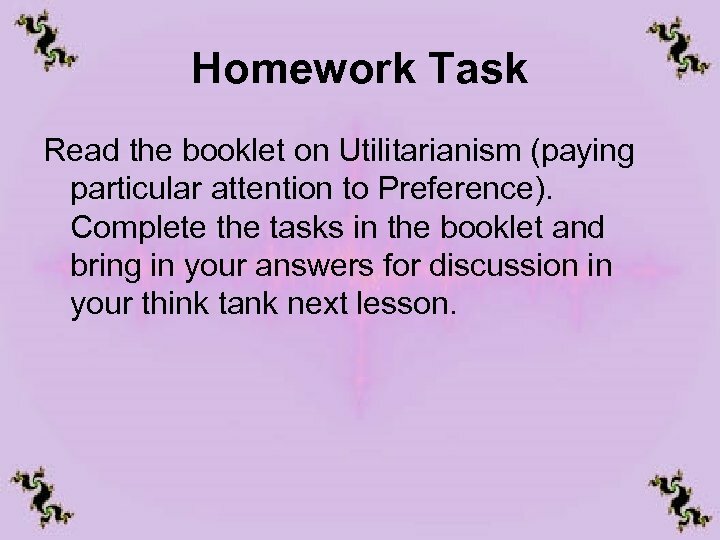 Homework Task Read the booklet on Utilitarianism (paying particular attention to Preference). Complete the tasks in the booklet and bring in your answers for discussion in your think tank next lesson. 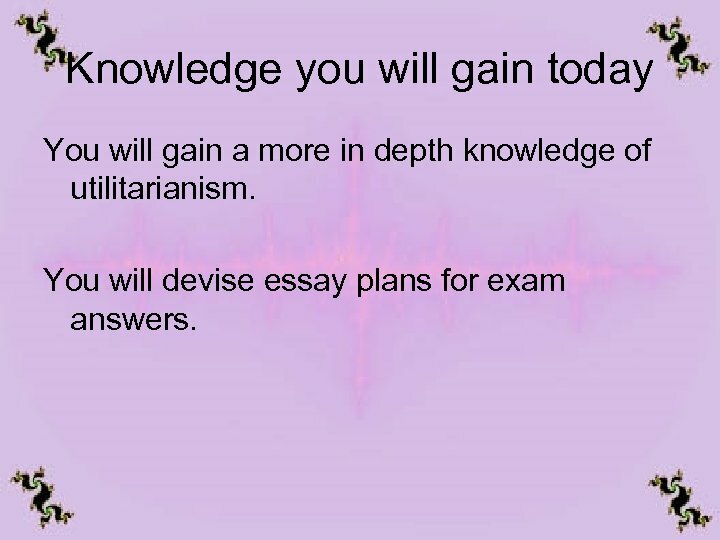 Knowledge you will gain today You will gain a more in depth knowledge of utilitarianism. You will devise essay plans for exam answers. Act, Rule And Preference Utilitarianism Act utilitarianism does not refer to general rules, but instead demands that the individual evaluate individual circumstances. Act-utilitarianism supposes that each particular action should be evaluated solely by reference to the merit of its own consequences (outcomes) i. e. the end justifies the means. The act-utilitarian asks, "How much pleasure or pain would result if I did this now? " 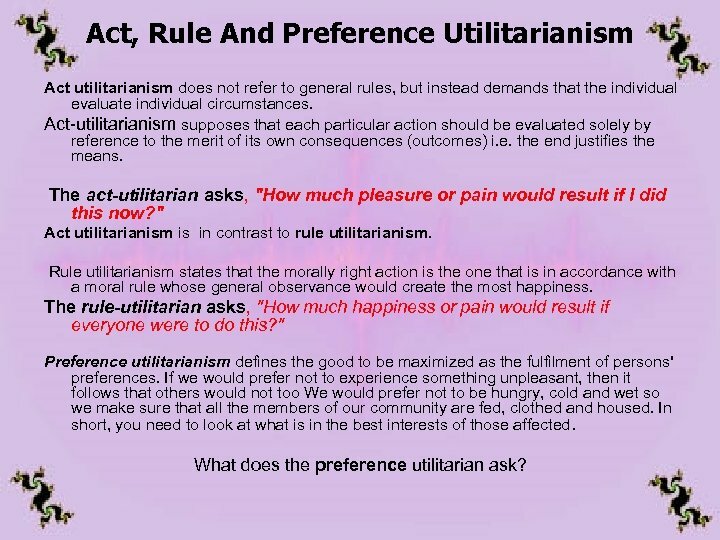 Act utilitarianism is in contrast to rule utilitarianism. 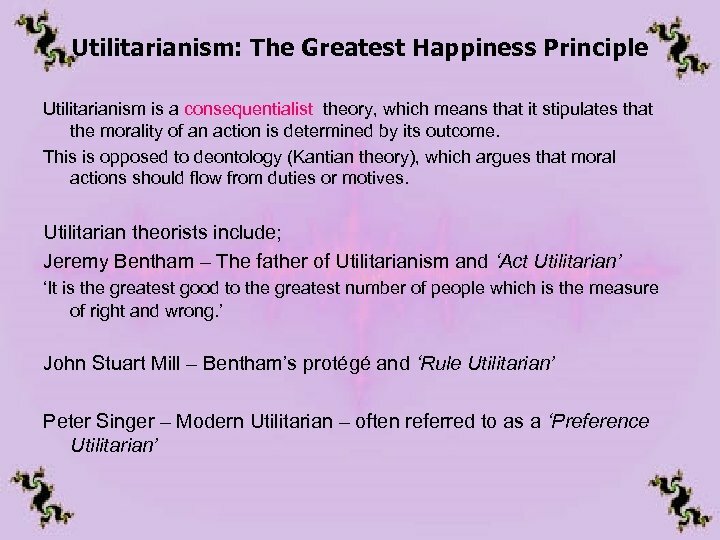 Rule utilitarianism states that the morally right action is the one that is in accordance with a moral rule whose general observance would create the most happiness. The rule-utilitarian asks, "How much happiness or pain would result if everyone were to do this? " Preference utilitarianism defines the good to be maximized as the fulfilment of persons' preferences. If we would prefer not to experience something unpleasant, then it follows that others would not too We would prefer not to be hungry, cold and wet so we make sure that all the members of our community are fed, clothed and housed. In short, you need to look at what is in the best interests of those affected. What does the preference utilitarian ask? 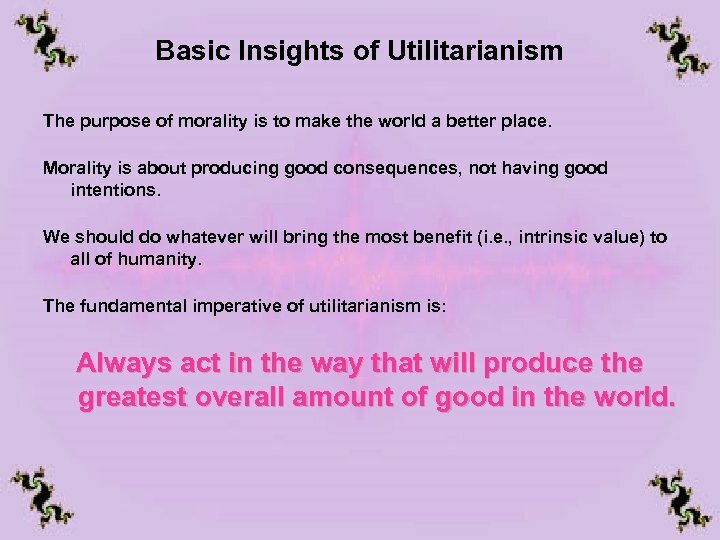 Basic Insights of Utilitarianism The purpose of morality is to make the world a better place. Morality is about producing good consequences, not having good intentions. We should do whatever will bring the most benefit (i. e. , intrinsic value) to all of humanity. The fundamental imperative of utilitarianism is: Always act in the way that will produce the greatest overall amount of good in the world. Jeremy Bentham’s theory is divided into 3 parts: • His view on the goals and motivation of all human beings, namely happiness (pleasure). 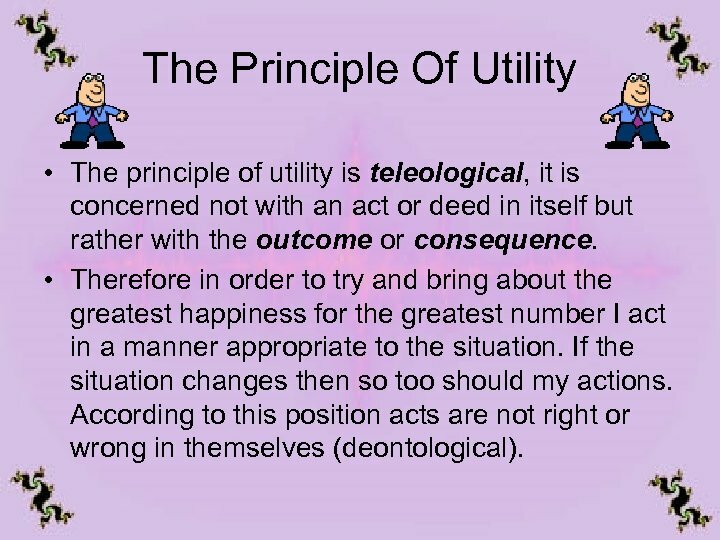 • The Principle of Utility (Bentham’s moral rule). This is more usually referred to as the Greatest Pleasure Principle. • The Hedonic Calculus which is his system for measuring how good or bad a consequence is. Utility refers to the (predicted) amount of happiness caused by an action. Bentham puts it thus: "By the principle of utility is meant that principle which approves or disapproves of every action whatsoever, according to the tendency which it appears to have to augment or diminish the happiness of the party whose interest is in question: or, what is the same thing in other words, to promote or to oppose that happiness. I say of every action whatsoever; and therefore not, only of every action of a private individual, but of every government" Bentham (1789) Bentham’s words are simply saying that ‘an action is right if it produces the greatest good for the greatest number, ’ where the greatest good is pleasure and the least pain or sadness, and the greatest number is the majority of people. 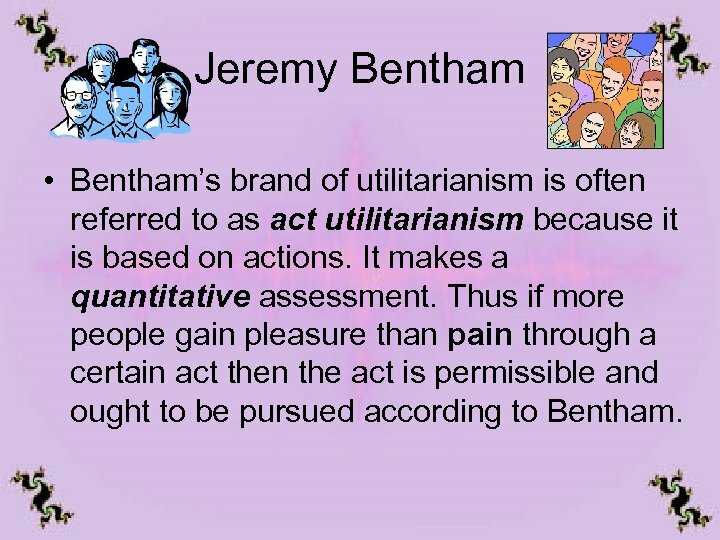 Bentham’s Act Utilitarianism Bentham equated happiness with pleasure and the absence of pain (an empirical observation - people desire pleasure and seek to avoid pain). "The greatest happiness of the greatest number is the foundation of morals and legislation. “ Jeremy Bentham His scientific mind led him to believe that the study of ethics could be undertaken in a practical way, carefully measuring the possible consequences or outcomes of an action before deciding which choice to take. What was revolutionary about Bentham’s theory was that it resulted in all people being considered when making laws. 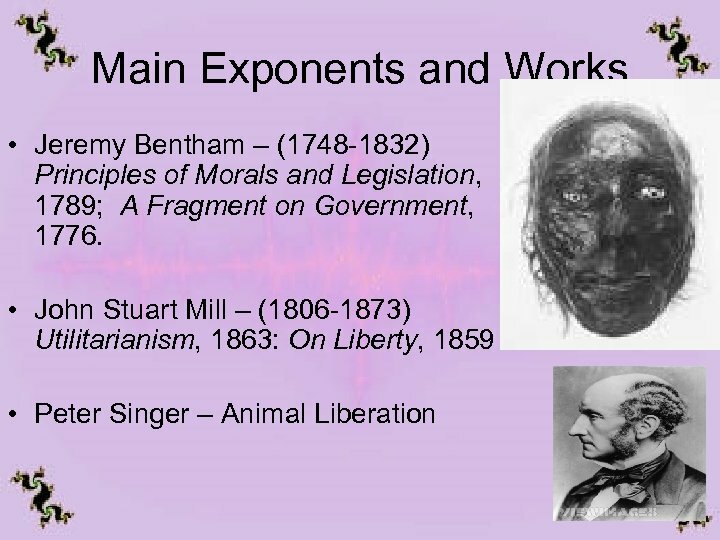 Bentham’s theories led to extensive social reform affecting Parliament, criminal law, the jury system, prisons, savings banks, cheap postage etc, etc. Bentham did not differentiate on happiness – he thought it was all the same, famously saying, 'All things being equal, pushpin is as good as poetry'. 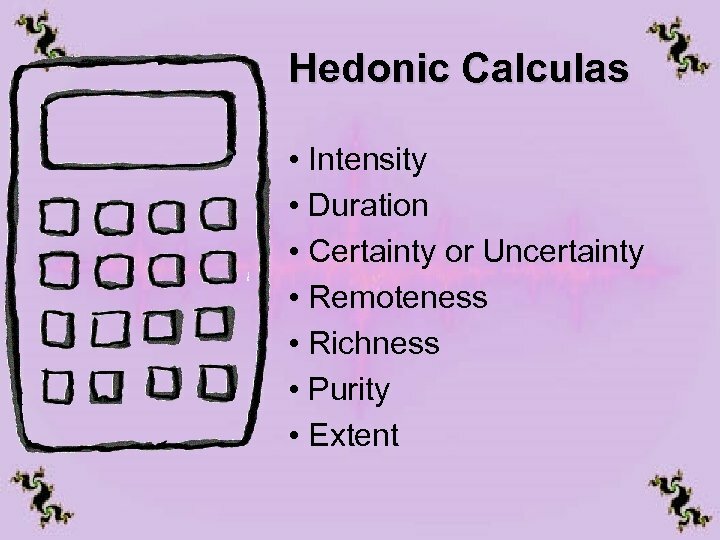 His hedonic calculus (also called the ‘felicific’ or ‘utility’ calculus) was useful in determining how to measure different amounts of pleasure. 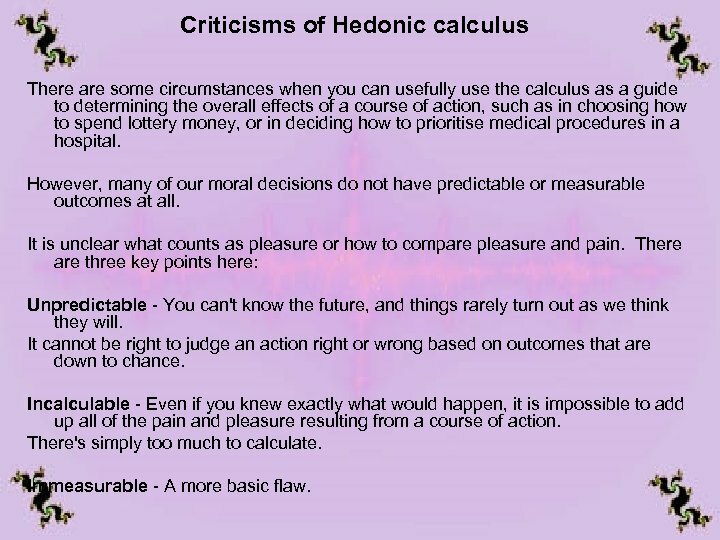 Criticisms of Hedonic calculus There are some circumstances when you can usefully use the calculus as a guide to determining the overall effects of a course of action, such as in choosing how to spend lottery money, or in deciding how to prioritise medical procedures in a hospital. However, many of our moral decisions do not have predictable or measurable outcomes at all. It is unclear what counts as pleasure or how to compare pleasure and pain. There are three key points here: Unpredictable - You can't know the future, and things rarely turn out as we think they will. It cannot be right to judge an action right or wrong based on outcomes that are down to chance. Incalculable - Even if you knew exactly what would happen, it is impossible to add up all of the pain and pleasure resulting from a course of action. There's simply too much to calculate. Immeasurable - A more basic flaw. 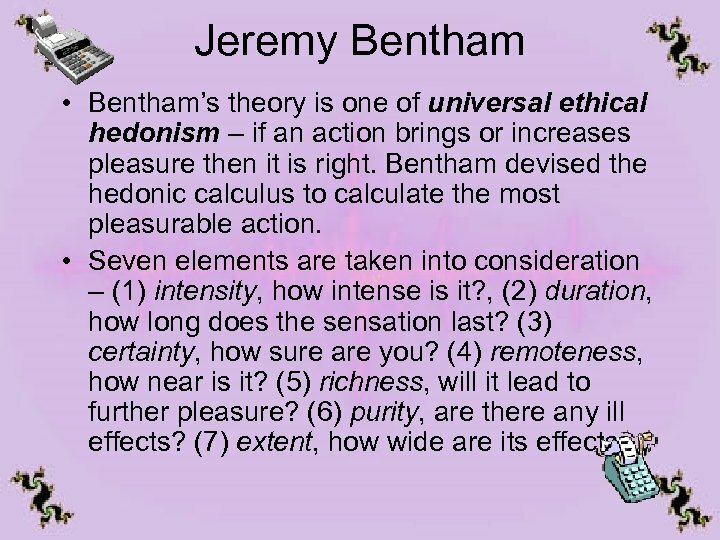 Criticisms of Bentham continued: Is Pleasure Incalculable? Even with the simplest event - choosing whether to buy a toy or a magazine for a child - it is impossible to decide on a value to give for happiness. Is the joy of reading a magazine more intense than the joy of playing with a toy? Pleasure cannot be measured, so the idea of adding it all up doesn't work. There is also something instinctively wrong with judging the morality of an action by it’s outcome – a person motivated solely by greed or revenge might choose a course of action that happens to make the greatest number of people happy. Does this make him a good person? Even more concerning is the possibility of sadists whose pleasure at torturing others is so great this in itself makes their actions good. The theory seems to support the exploitation and abuse of minority groups if it pleases the ruling majority. Who does the calculating? Will the outcome depend on who is doing the calculating? John Stuart Mill: Rule Utilitarian “Actions are right in proportion as they tend to promote happiness; wrong as they tend to produce the reverse of happiness. By happiness is intended pleasure and the absence of pain. ” Mill believed that quality was more important than quantity when it came to pleasure. He developed a system of higher and lower pleasures. For example, the pleasures of the mind are far superior to the gratification of the body’s desires. ‘It is better to be a human being dissatisfied than a pig satisfied; better to be Socrates dissatisfied than a fool satisfied. ’ Some general principles are formulated. From these, certain actions will be ruled out as unacceptable. The principle of utility is therefore applied to a rule, so the rule will hold if in general following it leads to greater happiness. This means that in an individual case, even though an injustice might bring about greater happiness, if it goes against the general principle that injustice tends to lead to misery and a reduction in happiness, it is deemed wrong. 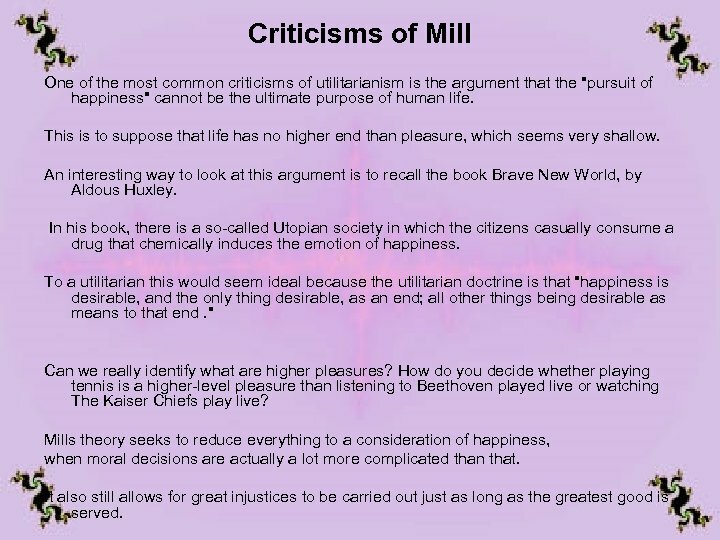 Criticisms of Mill One of the most common criticisms of utilitarianism is the argument that the "pursuit of happiness" cannot be the ultimate purpose of human life. This is to suppose that life has no higher end than pleasure, which seems very shallow. An interesting way to look at this argument is to recall the book Brave New World, by Aldous Huxley. In his book, there is a so-called Utopian society in which the citizens casually consume a drug that chemically induces the emotion of happiness. To a utilitarian this would seem ideal because the utilitarian doctrine is that "happiness is desirable, and the only thing desirable, as an end; all other things being desirable as means to that end. " Can we really identify what are higher pleasures? How do you decide whether playing tennis is a higher-level pleasure than listening to Beethoven played live or watching The Kaiser Chiefs play live? Mills theory seeks to reduce everything to a consideration of happiness, when moral decisions are actually a lot more complicated than that. It also still allows for great injustices to be carried out just as long as the greatest good is served. 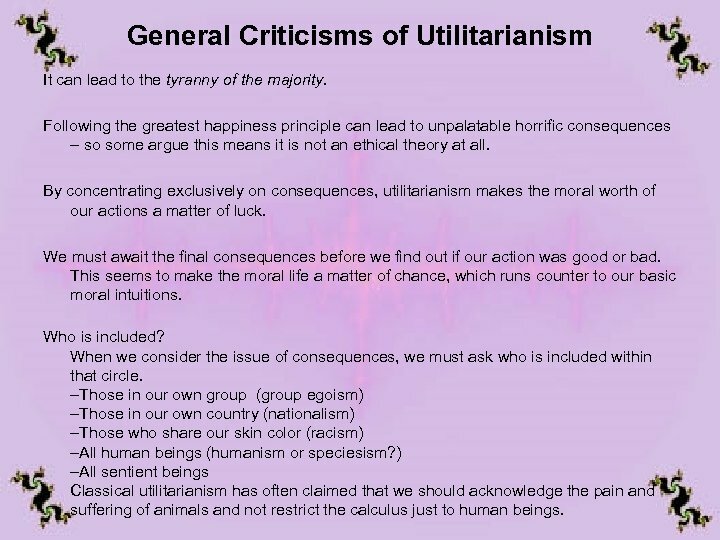 General Criticisms of Utilitarianism It can lead to the tyranny of the majority. Following the greatest happiness principle can lead to unpalatable horrific consequences – so some argue this means it is not an ethical theory at all. By concentrating exclusively on consequences, utilitarianism makes the moral worth of our actions a matter of luck. We must await the final consequences before we find out if our action was good or bad. This seems to make the moral life a matter of chance, which runs counter to our basic moral intuitions. Who is included? When we consider the issue of consequences, we must ask who is included within that circle. –Those in our own group (group egoism) –Those in our own country (nationalism) –Those who share our skin color (racism) –All human beings (humanism or speciesism? ) –All sentient beings Classical utilitarianism has often claimed that we should acknowledge the pain and suffering of animals and not restrict the calculus just to human beings. 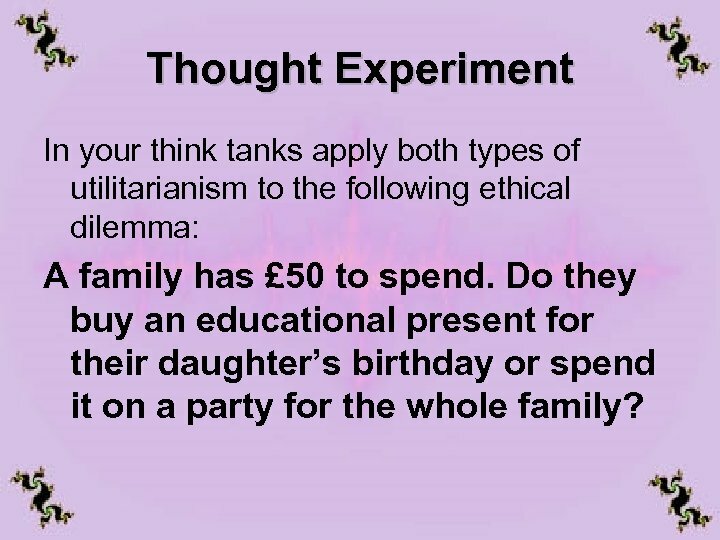 Thought Experiment In your think tanks apply both types of utilitarianism to the following ethical dilemma: A family has £ 50 to spend. Do they buy an educational present for their daughter’s birthday or spend it on a party for the whole family? 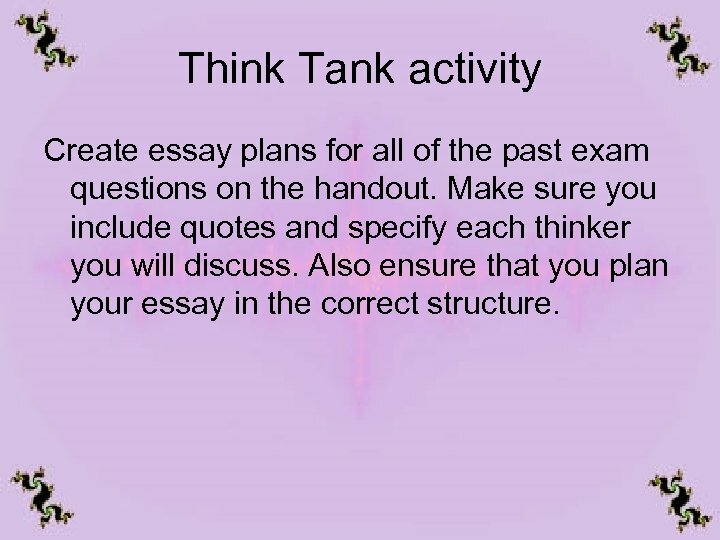 Think Tank activity Create essay plans for all of the past exam questions on the handout. Make sure you include quotes and specify each thinker you will discuss. Also ensure that you plan your essay in the correct structure. 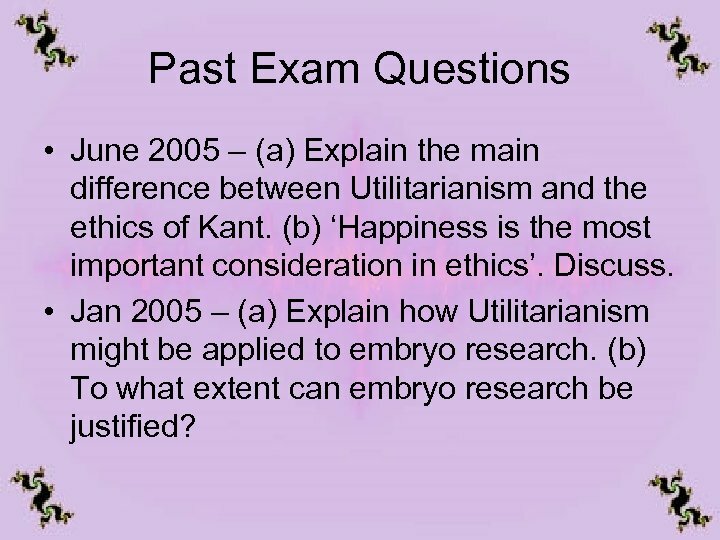 Past Exam Questions • June 2005 – (a) Explain the main difference between Utilitarianism and the ethics of Kant. (b) ‘Happiness is the most important consideration in ethics’. Discuss. • Jan 2005 – (a) Explain how Utilitarianism might be applied to embryo research. (b) To what extent can embryo research be justified? 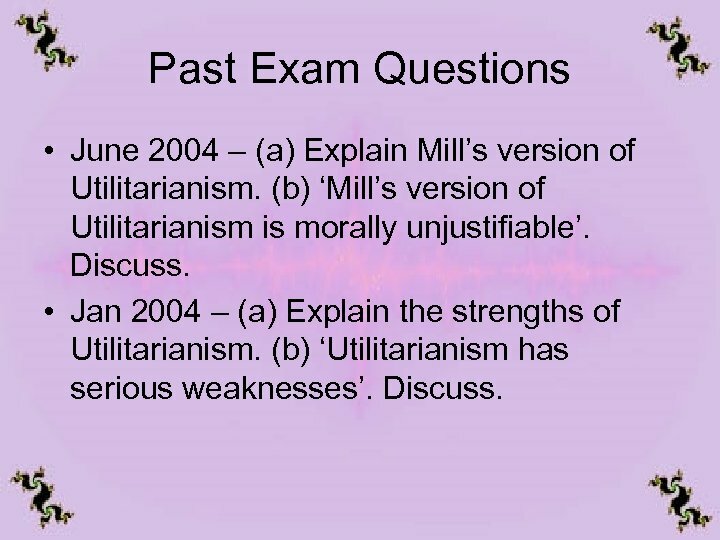 Past Exam Questions • June 2004 – (a) Explain Mill’s version of Utilitarianism. (b) ‘Mill’s version of Utilitarianism is morally unjustifiable’. Discuss. • Jan 2004 – (a) Explain the strengths of Utilitarianism. (b) ‘Utilitarianism has serious weaknesses’. Discuss. 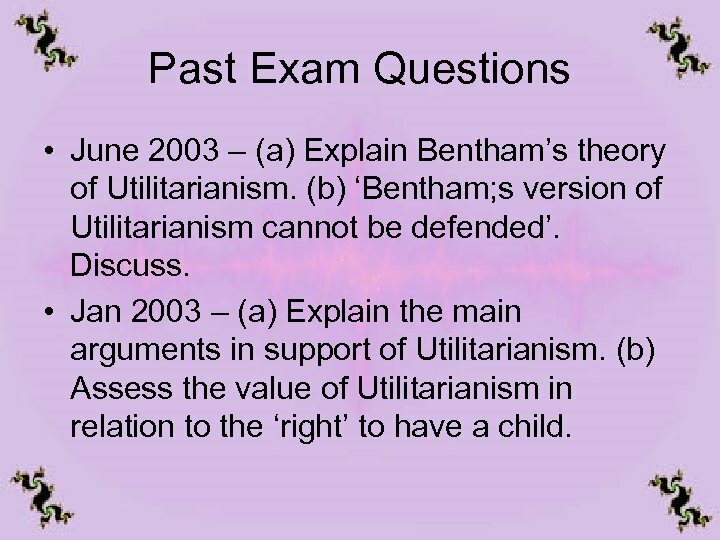 Past Exam Questions • June 2003 – (a) Explain Bentham’s theory of Utilitarianism. (b) ‘Bentham; s version of Utilitarianism cannot be defended’. Discuss. • Jan 2003 – (a) Explain the main arguments in support of Utilitarianism. 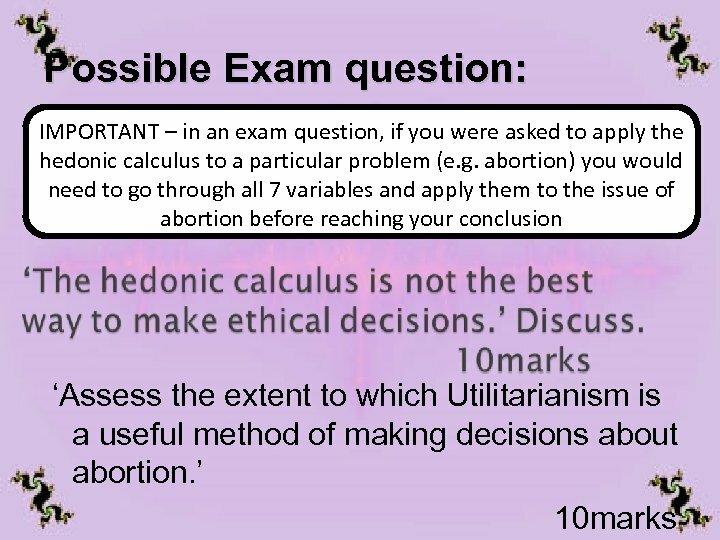 (b) Assess the value of Utilitarianism in relation to the ‘right’ to have a child. 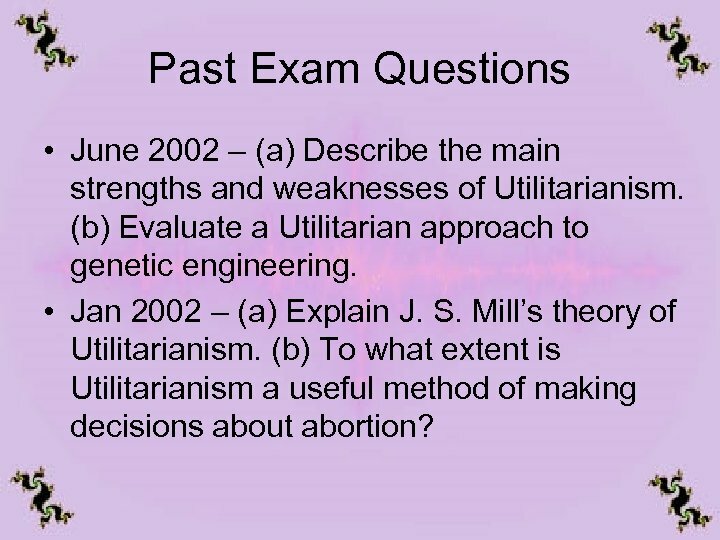 Past Exam Questions • June 2002 – (a) Describe the main strengths and weaknesses of Utilitarianism. (b) Evaluate a Utilitarian approach to genetic engineering. • Jan 2002 – (a) Explain J. S. Mill’s theory of Utilitarianism. 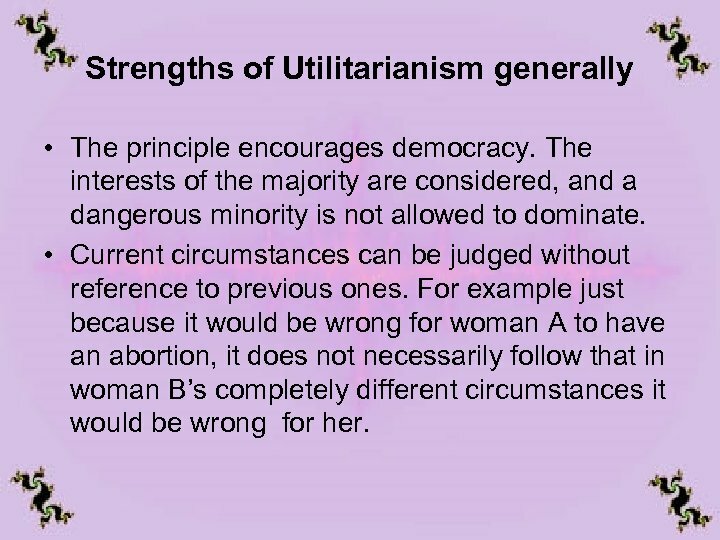 (b) To what extent is Utilitarianism a useful method of making decisions about abortion?